There are many dreamed-of and a number of dreamy records which reflect the American idea of freedom from a musical point of view. One of these was presented by frontman Lowell George and his superb group Little Feat in what the musical experts praised as a »symbiosis of anarchistic primitive folklore and rock finesse« (rororo Rocklexikon). The high standard which the musicians maintain over the two sides of the LP is established with "Hi Roller", a funky, energetic opening number. The multi-part title number "Times Loves A Hero" follows on with a more subdued tempo but with great dive and sophisticated percussion, which proves itself to be the most important element and governs the whole album. 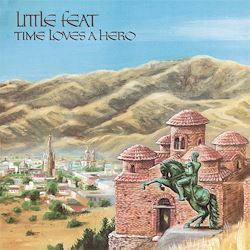 Little Feat conjures with traditional forms, gets you on the dance floor with "Old Folks Boogie" and serves up a tasty mixture of honky-tonk and blues, which is refined with powerful guitar solos. Just like a picture puzzle, rhythmic figures and figurettes dart hither and thither out of the background of this handcrafted and stalwart filigree rock ("Red Streamliner", "Keepin‘ Up With The Joneses"). But simplicity and softness is also possible: The message in "Missin‘ You" needs nothing more than chords on the acoustic guitar and men’s voices with a southern sound.